The route of the 2015 Tour de France was presented in Paris today. There will be 3 stages in the Pyrenees. Tarbes – Col de la Pierre Saint Martin. Updated on 20th October 2014. New rumours about Tour de France 2015 in the Pyrenees. Stage finish at La Pierre-Saint-Martin on 14th July. ASO confirm 15th July Pau to Luchon. The route will be presented by ASO in Paris on 22nd October 2014. 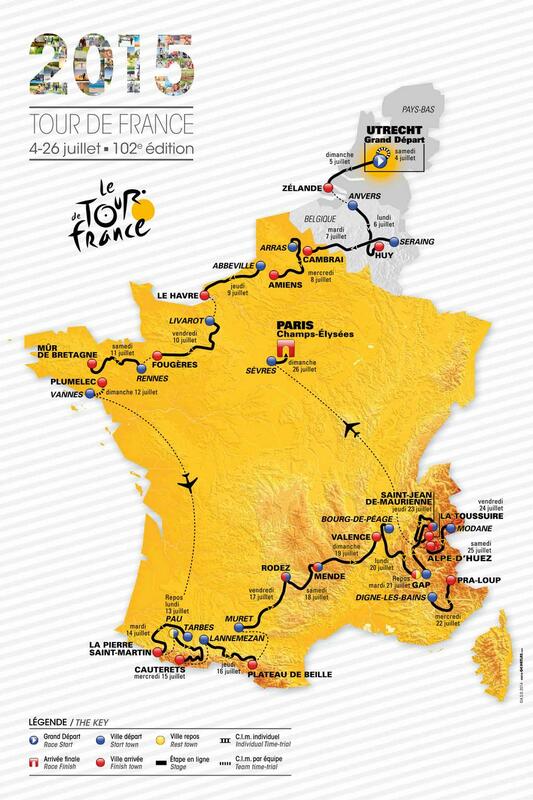 This is a page of rumours, hearsay and innuendo about the 2015 Tour de France Route. It may be right it may be wrong, it’s just for fun. The 2015 Tour de France route will start in Utrecht, Netherlands. It will be the 6th time the grand depart has been in the Netherlands. Thursday 16th july Lannemezan Plateau de Beille Stage in memory of Fabio Casartelli. Friday 24th July Saint-Jean-de-Maurienne La Toussuire May also be l’Etape du Tour Mondovelo on 19th July. and bike rental between Col du Tourmalet and Col d’Aubisque. Pyrenees Bike Rental. 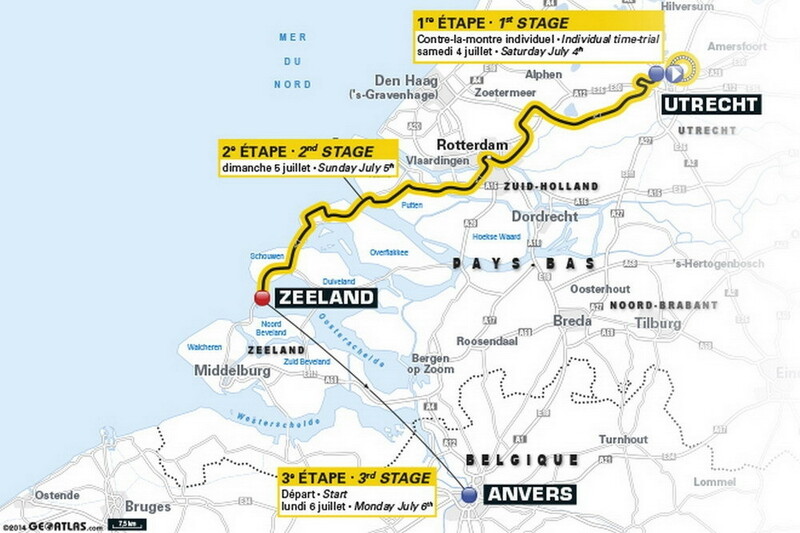 Stage 2 of the Tour de France will go from Utrecht to Zeeland. The Tour de France organisers seized the opportunity provided by the third edition of the World Ports Classic to unveil new details about the course of the 2015 edition. The bunch will roll out of Utrecht the day after the opening time trial and race to the sea! Tour de France in Brittany. Stages in the southern Alps. The mayor of Rodez is very optimistic. Le Telegramme has updated what it believes will be the stages in Brittany. This says that the stage on 20th July will finish at Pra-Loup. According to these articles stage 7 will start in Livarot. Tour to commemorate Australian soldiers on the Somme. The newspapers have been busy this week. Could stage 19 be a mountain ITT? The distance between SJdM and La Toussuire is ideal for this. Plus there are other roads leading down from the mountain, allowing cars DSs and officials to return to the start and follow more than one rider, without conflicting with the race. Also, four Alpine stages with three mountain top finishes seem a little too brutal for the Tour. I think that is a real possibility, La Toussuire would be ideal. Four stages are possible but I would guess that there will only be 2 mountain top finishes in the Alps and two in the Pyrenees. La Pierre-Saint-Martin on 14th July. Wow! I like it. I think the shark would too. It would also be great going up. More on the Pyrenees from Sud Ouest. Will there be 3 uphill finishes in 3 days in the Pyrenees? I doubt it! Conformation of La Pierre Saint-Martin from France 3. Tour de France confirm Col d’Aspin. Le Depeche says Tarbes to Cauterets.